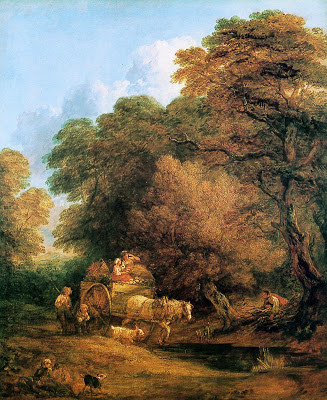 The Market Cart by Thomas Gainsborough is set in the scenery of rural England in 1786. The work is currently at home in National Gallery, London. The painting is of country folk returning their farm goods from the market. Within the work you can find a wood cutter picking up faggots, a family on the way to their market, and a trustworthy dog walking along the horse. It is a peaceful scenery with large oaks and nice weather that is about to turn into evening. It is a family tired, making their way home, after a long day traveling to and from the local market. Thomas Gainsborough was a child prodigy that learned the love for art from his mother and was found painting nearly everything within his neighborhood. His father, John Gainsborough, was a cloth merchant in Sudbury, Suffolk. Thomas studied under Hayman in London and then moved on to continue his occupation. Around the age of 20 Thomas married Margaret Burr the illegitimate daughter of the Duke of Bedford. His career took off after moving to Bath where he found work with members of the high society. In 1768 he founded the Royal Society. He was able to complete over a thousand great art pieces during his lifetime from 1727-1788. It is believed that the farm market started over 10,000 years ago in Turkey and the Middle East. Agriculture finally but slowly made its way to England around 6,500 years ago. Such markets grew as farming become more common place in the predawn of modern society. In many cases such markets were held every week and offered an opportunity for country folk to sell goods and obtain needed supplies. It was also considered a social hub during the era where the latest rumors could be heard and spread. The concepts of Mercantilism became British policy during this time. Mercantilism is the concept where merchants and government banded together to create greater spheres of power, influence and wealth. Wealth was often generated from trade and diverted to London where British Ships were built to develop global power and to crush American smuggling operations with the French, Dutch and Spanish. At about the time "The Market Cart" was being painted there was a movement to the Industrial Revolution, 1770s to the 1820s, that changed the landscape of rural farming to a more productive powerhouse. Thus the painting is one of Romanticism and completed during the time of rapid change where farmers began the long climb to industrial cities that continues on today. The Agricultural Revolution was also a couple of decades in the mix and the average farmer could grow approximately 19 bushels of wheat, oats or barley off of an acre. During this time males could find work as day laborers while breaking their back for subsistence living. Tasks often included threshing, mowing, cutting wood, carting, collecting faggots (as seen in the picture), or other simple farm tasks. Additional compensation could be found in the form of housing, beer, food, or clothing. It was definitely not an easy life for most people but land was plentiful and hopes were high.